With events from Hong Kong to Chicago, the Kellogg Impact Series has convened hundreds of alumni, academics and business leaders to engage in discussion and debate over timely business issues. 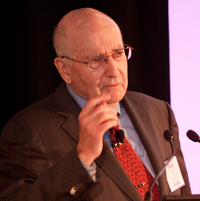 The series of global events kicked off Feb. 8 in London, featuring renowned marketing professor Philip Kotler, who shared his perspectives on the latest challenges in management and marketing. Kotler, the S.C. Johnson & Son Professor of International Marketing, was recently named among the most influential thinkers in business by Forbes and is the author of dozens of books, including the forthcoming Marketing 3.0: From Products to Customers to the Human Spirit. 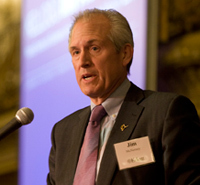 The Feb. 19 Chicago event featured a talk by Jim McNerney, chairman, president and CEO of The Boeing Company, who addressed the importance of maintaining a competitive edge in today's global economy. Complementing McNerney's address was a panel discussion by Interim Dean Sunil Chopra and Associate Professor of Management & Strategy Benjamin F. Jones, who discussed the effect of the global economic recession on multinational businesses. K.C. Chan, Hong Kong's secretary for financial services and the treasury and former dean of business and management at Hong Kong University of Science and Technology, was the featured speaker at the March 19-20 event in Hong Kong, which explored the impact of the current global financial crisis on Asia. The event also featured a special address by Chopra and a distinguished panel of Kellogg faculty, who presented their views on global business practices. Subsequent conferences are planned for San Francisco (May 11) and New York (June 3). Promod Haque '83, managing partner of Norwest Venture Partners, will provide the keynote address in San Francisco, while Gary W. Parr '80, a vice chairman of Lazard, will serve as the keynote speaker in New York. The Kellogg Impact Series is designed to provide a global forum on the future of business, innovation, leadership and society. "Following the success of our Centennial Conference Series last year, the Kellogg Impact Series continues to facilitate lifelong learning opportunities for the Kellogg community worldwide," Chopra said. "Kellogg Impact events allow attendees to engage in insightful discussions on timely topics that are facing the business world today."